Irvine, California - Pasternack, a leading provider of RF, microwave and millimeter wave products, has launched a new line of USB-controlled Phase Locked Loop (PLL) frequency synthesizers. In RF & Microwave communications systems where signal integrity is of prime importance, PLL synthesizers offer high levels of frequency stability and accuracy with exceptional phase noise characteristics that allows components in the signal chain to perform at their optimum levels. These new PLL synthesizers can be useful in applications involving signal generators, benchtop test and measurement, electronic warfare, and microwave radios. Pasternack's six new models of PLL frequency synthesizers cover a broad range of frequency bands from 25 MHz to 27 GHz. 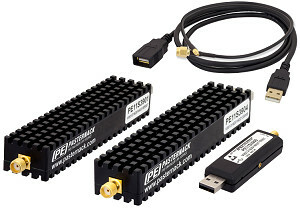 The compact and rugged SMA-connectorized designs support a USB 2.0 interface with a PC computer that supplies DC power and GUI command control. Models offer high output power levels that range from +10 dBm to +19 dBm typical, and output attenuation is adjustable up to 50 dB in 1 dB steps. Phase locked speed is 1 msec typical and phase noise is as low as -108 dBc/Hz at 100 MHz offset. Additional features include a 50 MHz internal frequency source and optional external reference with supplied cable. Frequency resolution can be adjusted using either Integer (default) or fractional modes with resolution to a step size down to 1 MHz. Modules support functional LED indicators that confirm a USB connection, phase locking and unlocking, and RF power disable. All models are RoHS and Reach compliant and are classified as EAR99. A comprehensive user manual and VISA compliant software package can be downloaded from the Pasternack website. "Pasternack's six new models of USB-controlled PLL Frequency Synthesizers offer a wealth of desirable features for designers and are ideal for test and measurement applications. Each model comes complete with accessory cables, downloadable user manual and command control software that's ready to ship direct from stock with no MOQ," said Tim Galla, Active Component Product Manager at Pasternack. Pasternack's USB-controlled PLL synthesizers are in-stock and ready for immediate shipment. For inquiries, Pasternack can be contacted at +1-949-261-1920. Over the last 40+ years, a lot has changed in the RF and Microwave industries. However, some things remain the same, like Customers' demand for a reliable source of quality products supported by superior technical and customer service. Since 1972, Pasternack has steadily grown by aligning its offerings to match the needs of our Customers. We maintain an inventory of more than 40,000 products that are always available which gives you access to products ranging from the rare, hard-to-find specials to the broadest array of industry standards. Today, Pasternack is a global supplier of RF and Microwave components supported by a growing list of 19 International Distributors who service customers in more than 35 countries worldwide and partner with us in pursuit of our vision to be the world's most recognized and trusted provider of urgently needed RF/Microwave components and assemblies.